One item discussed on the blog last summer were the declining delinquency rates for debt across Oregon. That was important because as households increased their debt during the previous expansion, when the bottom fell out it became much more difficult to finance those larger debts. Declining delinquency rates imply improved household balance sheets and consumers are able to stay current on their debts, pay them down or off, or in the other case the debts may be written off by the creditor as the individual or household defaults. Improving household balance sheets are important for both the health of the economy and growth moving forward. The following post takes a quick look at the same debt data, available from the Federal Reserve Bank of New York, but examines the level of debt relative to income to get a sense of the size and how balance sheets are improving. While the NY Fed has further information at the national level, in terms of the type of debt, at the local level the data available consists of automobile loans, credit cards and mortgages. This first graph shows the ratio of these debts to total personal income in both Oregon and the U.S. Over the period for which we have this data, debts were increasing faster than income growth through about 2007, hence the rising ratio. As the recession hit you can see stabilization in the ratio as income falls, but so too does the level of debt (combination of not taking on more debt, banks lending less, paying off more debt and outright defaults). In the first couple years of the expansion, this ratio has continued to decline (and fully expect 2012 data to show this trend continuing) as individuals and households are repairing their balances sheets. This includes the same items mentioned above – taking on less new debt, paying down existing debt or defaulting – but also with gains in personal income helping to support his balance sheet repair. It’s hard to tell over this time period what the appropriate or even the average level of debt to income “should” be but in terms of improving household finances, a declining ratio was certainly in order for most Americans, and we do know that the U.S. savings rate has increased during the crisis and has held up relative to the levels seen during the housing boom. 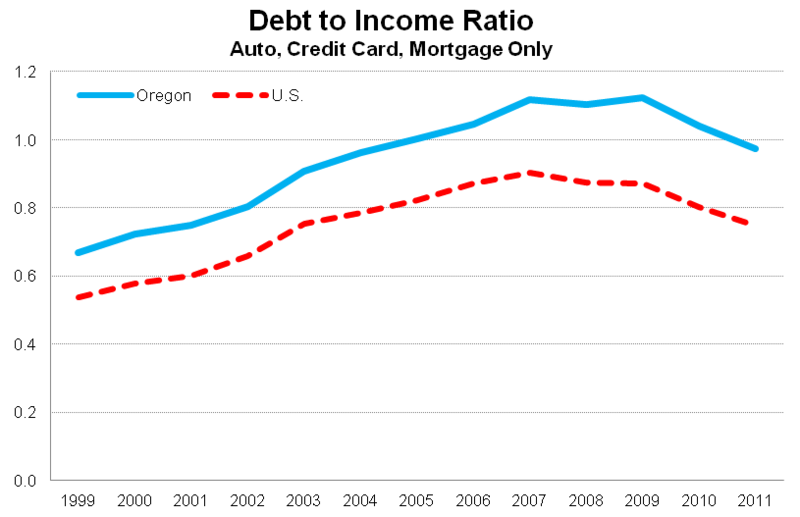 Oregon’s overall debt is somewhat higher, relative to income, than the U.S. for two reasons. 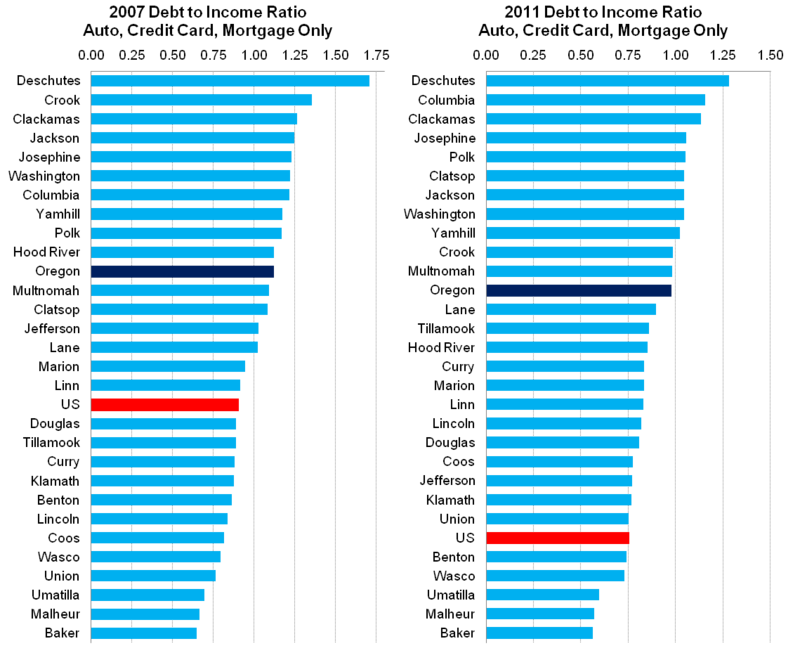 One, yes, Oregon’s personal income is a bit lower than the U.S. average as discussed in the media and reports. For any given debt level, this fact alone would push the ratio higher for Oregon relative to the rest of the nation. 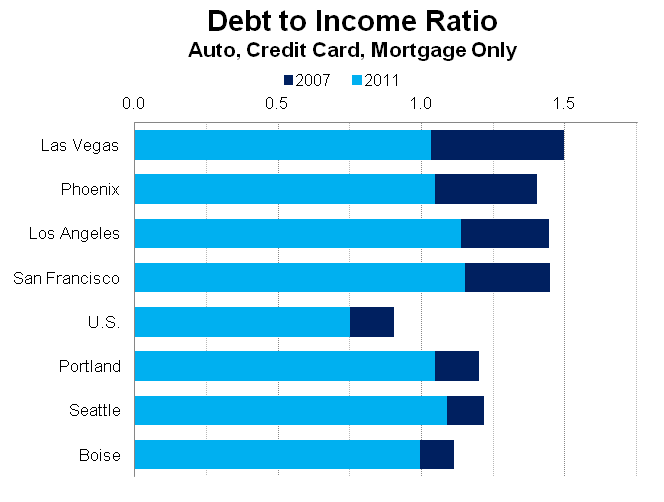 Second, and this is the primary reason for the higher ratio, our mortgage debt is simply larger in Oregon. This could be due to higher home prices than average, larger loan balances (less paid off) or some combination of the two. Based on the latest American Community Survey (using the 2009-11 3 year estimate) it appears to be both. Oregon’s median home value is higher than the US (about $245,000 vs about $180,000) and the percentage of Oregon housing units with a mortgage (69.5%) is higher than the U.S. (67.2%). The graph above looks at the state total, but how do individual counties compare? Below are the same debt to income ratios for 2007, when the ratios peaked, and 2011, which is the most current year we have data for. Some regional patterns do emerge based on this. The higher ratios are generally seen in Central and Southern Oregon and the Portland suburbs (of, if you prefer, the Portland MSA ex Multnomah). This, from my vantage point, speaks to the housing bubble. Bend and Medford experienced large housing booms (and busts), which coupled with strong in-migration, led to higher mortgage debt levels both because prices were higher but also because more recent purchases generally have higher debt balances as owners have not lived there long enough to pay down the debt. You can see this same dynamic playing out in other locations like Hood River, Polk and Yamhill counties that experienced stronger population growth. On the other end of the spectrum are many Eastern and Southern Coast counties. Home prices are generally lower in these areas and population growth during the past decade has also been lower. Another aspect you might have been able to see in the graphs above is the fact that every single county has seen their debt to income ratio improve over these years. To better show this improvement, the following graphs the same data for 2007 and 2011 but sorts the counties from the largest improvement to the smallest improvement in the ratio. (The difference between the dark blue and light blue.) 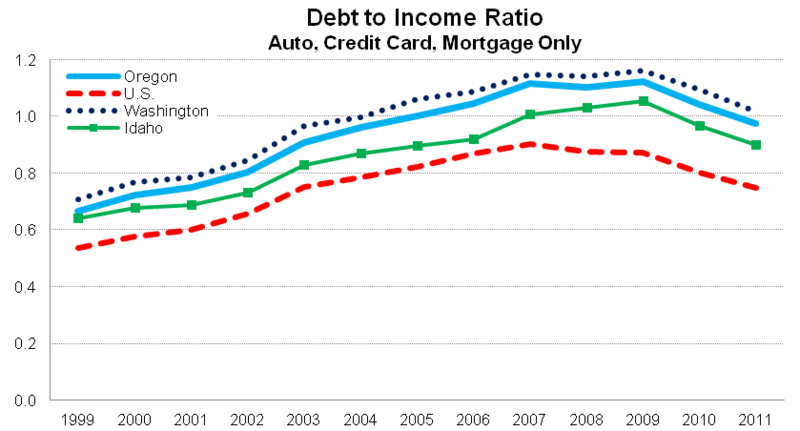 The larger the improvement in the debt to income ratio, the higher the rank. It is encouraging that the largest improvements in these ratios have been in some of the counties where the ratio had been highest (again, Central and Southern Oregon and Portland outside of Multnomah.) As the underlying economies continue to improve (or in some cases, begin to improve), expectations are for these debt levels, at least relative to income, to continue to improve. The smaller improvements are generally seen in the Eastern and Coastal counties which did not have as high of debt levels to begin with, so seeing smaller improvements is not as much of a concern. The two counties that stick out somewhat are Clatsop and Columbia with their relatively high debt levels but low improvement. This likely speaks to both housing costs and economic performance. Both counties have either higher home prices (Clatsop) or experienced larger population growth (Columbia) which work to increase mortgage debt levels. Both counties are also not experiencing as strong of economic growth in expansion as the statewide figures show. While Clatsop outperformed the state during the crisis the improvement in the past couple years has been slower in the county. Columbia suffered a worse recession than the state as a whole and its unemployment rate remains about 1 percentage points above the Oregon figure. Next, we turn to comparing Portland with a few select western MSAs. 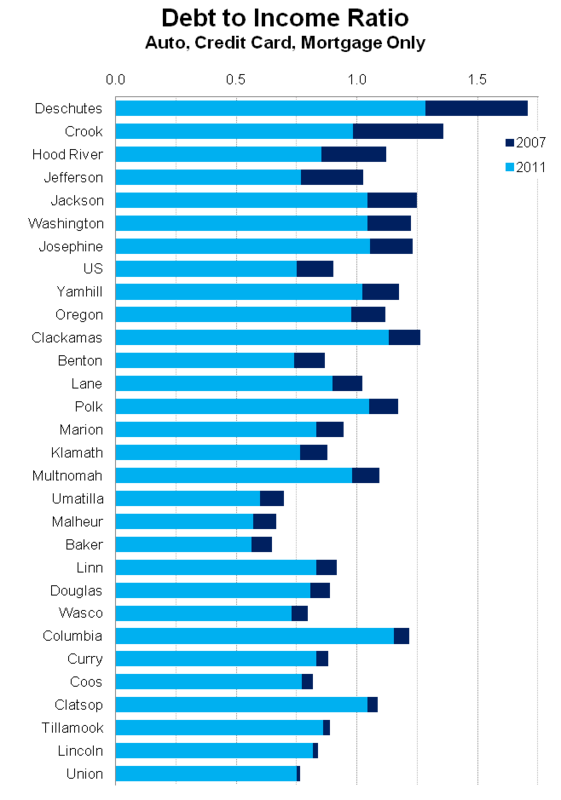 These are sorted the same way as the graph above – by improvement in the debt to income ratio from 2007 to 2011. It is interesting to see that the bubbilicous regions are back down to around the same levels are seen in other major western MSAs. This is encouraging from a bigger picture, household balance sheet perspective as these region had the furthest to go for improvement and, at least based on this ratio, the majority of the work appears to be done. Finally, the last graph shows the overall ratio for NW states. Washington’s debt to income ratio is a little bit higher than Oregon’s while Idaho’s is a little bit lower than Oregon’s. As mentioned above, this is likely due to overall housing costs and less about auto or credit card debt. Overall, it does appear that both U.S. and Oregon households are making improvements in their balance sheets. Debts on automobiles, credit cards and mortgages are declining relative to income which bodes well for both households and for economic growth. Other types of debt may be increasing – in particular student loans, which is the subject of a subsequent post – but these main categories are becoming more in-line with the income that is used to finance them. As the economic expansion continues, expectations are that these debt levels to likewise improve. I’m a student working on my MBA thesis. In your related post, you mention that county-level debt data was available through the New York Fed, however I’ve not been able to find it. How can I find it? Hi Shem. On the website that I link to, click on “Historical Reports” in black, just below the yellow/gold text near the top. Then click on “statistics by county” which is an excel file and has all the data you need. Hope this helps.